1.Prepare Avocado-Corn Butter: Prepare outdoor grill for direct grilling over medium-high heat. In medium saucepot, heat corn and 2 cups water to boiling over high heat; boil 10 minutes or until corn is tender. Drain and let cool; cut kernels from cob. Reserve half the corn for another use. 2.In bowl of food processor with knife blade attached, pulse remaining ingredients and corn until well combined. Makes about 1-1/2 cups. 3.Prepare Salmon: Spray salmon with nonstick cooking spray; sprinkle with salt and pepper. Place salmon and lemons on hot grill rack; cook salmon and lemons 8 to 10 minutes or until internal temperature of salmon reaches 145° and grill marks appear on lemons, turning salmon once halfway through cooking. Let stand 5 minutes. 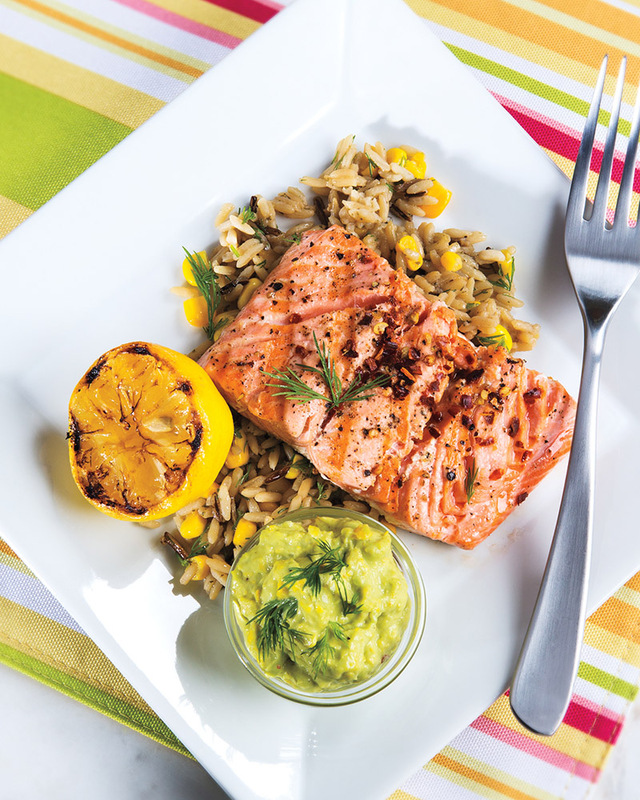 Serve salmon with lemons and Avocado-Corn Butter. > Avocado-Corn Butter can be prepared, covered and refrigerated up to 1 day. > Serve salmon alongside rice pilaf mixed with reserved corn. > If it’s your first time selecting avocados, try purchasing an unripe avocado, checking it every day for 2-3 days as it softens. Ripe avocados that yield to gentle pressure should be eaten within a day or two. Unripe, firm or green fruit can take 4-5 days to ripen at room temperature. When an avocado begins to yield to gentle pressure, place it in the refrigerator to slow the ripening process until use.